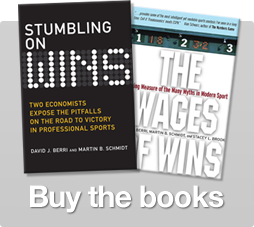 In our book we introduce two measures of performance, Wins Produced and Win Score. A few days ago I posted a brief comment explaining Win Score. Although the comment stated “It is important to note that this is not the same as Wins Produced,” a few readers of the Wages of Wins Journal seemed to miss this point. The blame falls on us, of course, since we have yet to make much effort to explain in this forum what we mean by Wins Produced. Let me begin by saying that how we calculate Wins Produced is detailed in the book. The discussion offers virtually none of the math behind this measure, but the steps we followed and the intuition is – I think – clearly explained. I do not wish to re-hash the entire book discussion in this forum, but I think I can offer a few comments that might better clarify where we are coming from. Before I start, though, I need to note that although the measures used in the book are similar to what we have used in our published articles, the metrics detailed in The Wages of Wins are not quite the same. So what is in the book has not been seen before. With that said, to understand the productivity measures detailed in the book you need to begin with our motivation. As economists we are interested in using productivity data generated by the NBA to answer questions of interest to us, other economists, and hopefully non-economists. For us to do this, we needed to make sense of the productivity data. The productivity measures I have seen others produce – and I have looked at most of what is out there – were not suited to our task. If players are trying to win, we need to relate what they do on the court to that objective. The measures I have seen failed to make that link, and therefore, could not be used in our research. It turns out that with a bit of math and statistical analysis, you can define what a player does in terms of wins. And it also turns out that you can link the team wins back to the number of wins our methods say the players produce. In other words, the approach in the book appears to be quite accurate, a point we note in the excerpt to Chapter Six. An example might help people see what we mean. If you click here you can see the Wins Produced for each player on the Miami Heat in the 2005-06 regular season. Miami won 52 games this year, and the summation of Wins Produced for the team is 51.2. Our analysis indicates that the three most productive players on the team were Dwayne Wade, Shaq, and Udonis Haslem. The productivity of Wade and Shaq may not be surprising to most NBA observers. That Haslem is the third most productive player on the team, though, is probably a bit unexpected. To calculate Wins Produced takes a bit of effort, and it really isn’t something you can do easily when you look at the box score in your morning’s paper. Hence the need for Win Score. Win Score is designed to be a simple metric that allows one to see quickly if a player had a good or bad game. And for research where you only wish to compare a player’s current performance to his past performance, Win Score is perfectly suited for such a task. Of course both metrics are consistent with one of the stories we tell in the book. Productivity in the NBA is not strictly about how many points you score. Rebounds, turnovers, steals, and shooting efficiency matter. And when you consider all these factors, properly weighted in terms of their impact on team wins, one can indeed link a player’s performance on the court to the final outcomes we see in the standings. 156 Responses to "Wins Produced vs. Win Score"
I understood what is Wins Produced, but by an article of Jeffrey Dobin at RealGM.com two days ago, to calculate the MVP. I don´t know if he used your same criteria, but both are very good methods of stats expressions, because in basketball will never exist an (exact) math formula to calculate performance or results, because the scoring value or possesion value of the “without the ball” game has too many factors, at both the defensive and offensive end. I haven´t read your book, and I like this website, but I think needs a makeup. Can you give the whole NBA WinsProduced list some day? To have an idea what “without the ball” game is: on the floor there are 10 players, and just one at a time can have the ball in his hands, that means he can can have the ball about a 10% of the game time(PG and stars a little more). The other 90% of the game, you need to do things like defend one on one or zone, make systems (cuts, curtains, shadows, rotations, passes, trash talk, dirty play, suggestions, get a spot to rebound or to receive the pass, help another teammate, etc…). You have inffluence on others scoring. That is difficult to measure. How do you measure Artest inffluence in Sacramento, with scoring efficiency?…It´s the same with Rodman, Wallace, Bowen. Rodman got five rings like starter, That´s lucky?